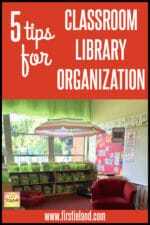 If you’re looking for classroom library organization ideas + a FREE editable introductory PowerPoint activity you can use with your own class on the first week of school, check out this step by step setup for 2nd and 3rd grade teachers all about organizing your classroom library by genre. When it comes to classroom library organization there are so many questions! How should you sort your books? What types of book bins should you buy? How do you keep track of all of your books? How can you get students to actually put books back in the correct place? What books should you have in your library in the first place? & Where exactly are all of these books coming from? Spoiler alert: You’re buying most of them. Win, win, win, win, win, win! Clear plastic shoe bins work great for paperback chapter books, magazine holders can be a good “book box” option for individual students, and sticky return address labels (80 per page) are perfect for labeling books (just double check to make sure you purchase the correct ink jet or laser printer option). Plastic crates or thicker plastic bins work well for picture books. You can find all of these items at the Classroom Library Organization section of my Amazon affiliate recommendation page HERE. Where can I download the classroom library organization freebie? 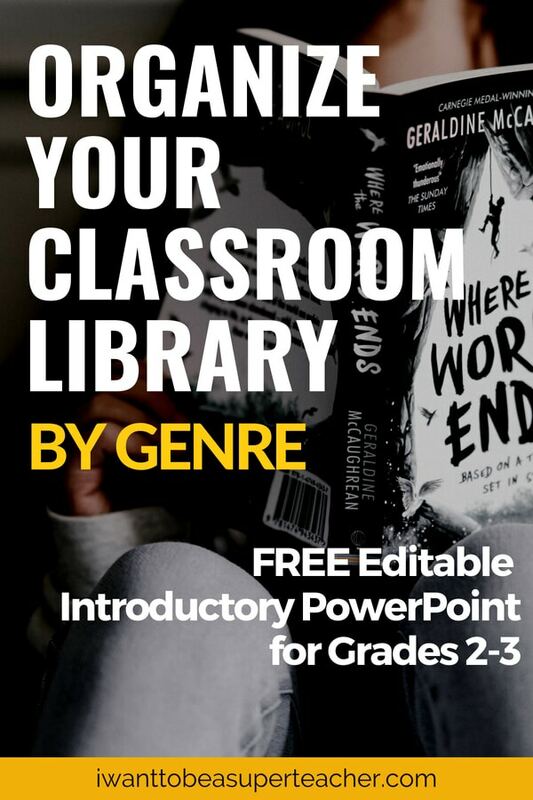 You can download the FREE PowerPoint I use to introduce this genre-based classroom library system to students on the first day of school at my TpT store HERE. 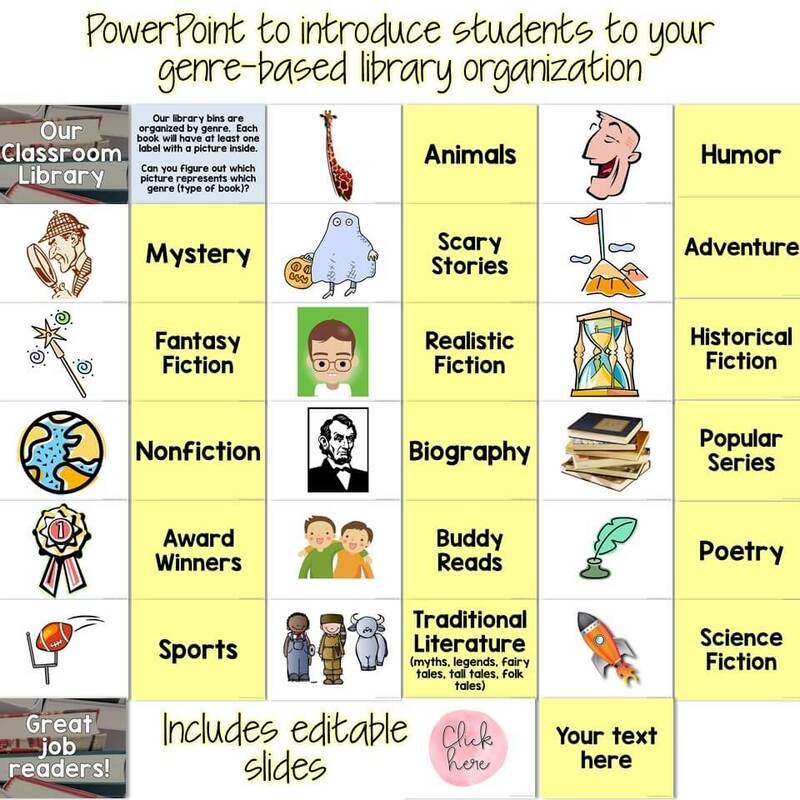 This PowerPoint file includes all the genres listed above + editable slides you can customize for any additional genres, topics, or images you might need. You can see all the slides included below. 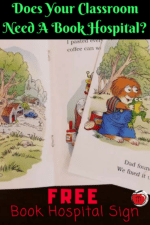 Do the kids really put the books back in the correct bins? This article originally appeared at the I Want to be a Super Teacher blog. You can find the original post HERE.